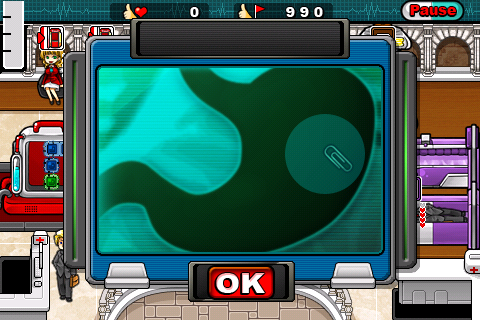 Are you Alright is a time management hospital based game that is currently out for the iPhone and the iPod Touch. If you are familiar with games such as Dinner Dash and Cake Mania, the concept of the games are rather similar compared to the games at easyslots.com. In this game, you play as a doctor travelling around the world getting your reputation up as well as saving patients. 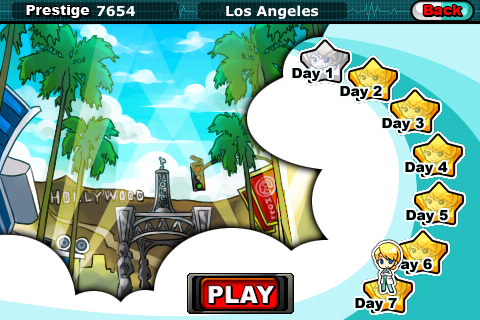 As you progress through the stages, you get to visit different hospitals all around the world. With reputation and prestige earned, you can upgrade your hospital to be able to provide the best service available for your patients. Time management games often requires player to be quick. Are you Alright is no different. There are several different machines in the hospital that serve different purposes. Patients would come in and request for different treatment at the same time. You have to be alert to their requirements and then bring them to the different stations accordingly. At specific stations, you are required to play mini-games in order to complete the treatment process. At the start, patients often require only 1 to 2 process treatments (temperature checking and then x-ray) before they finally pay up and leave the hospital. Patients would have a specific icon above their heads to inform you of which treatment is required. You then drag them to the specific machines to place them there. You must then perform the treatment by touching the machine (activating it. This is not needed once you have upgraded your hospital to include assistants). 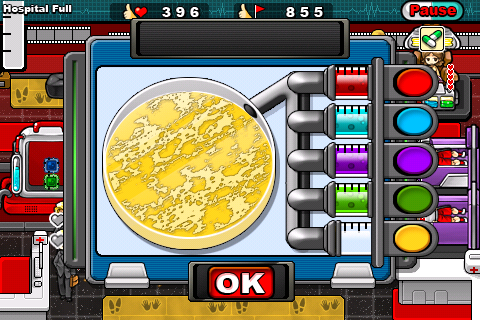 Depending on the treatment, some requires you to manually play a mini-game in order for the process to be successful. There are a several mini-games for example finding a foreign object in the stomach, pulling out blades on the skin and checking for the virus that the patient is being attacked from (I think, not so sure ain’t a doctor nor a bio student myself). There are several types of patients available. They all require some thinking and strategy in terms of planning who to serve first. Some patients for example the old man will die faster than the others. Another type of patient is the business man who will give you more prestige (points) then the rest. When you have all these different types of patients coming into the hospital, you better know who to serve first to ensure that you get no patients dying on you while squeezing them out for the maximum prestige offered. Prestige is used to meet objectives (a minimum requirement for each level) and for upgrades. You use prestige to upgrade machines to make them work better or simply hire an assistant to help you out in the busy hospital. Careful spending will result in higher efficiency and an easier time to get by each level. You are also provided with brain chips to help you in each level. Before each level, you are allowed to choose different chips that provide different effects when enabled during the course of the level. 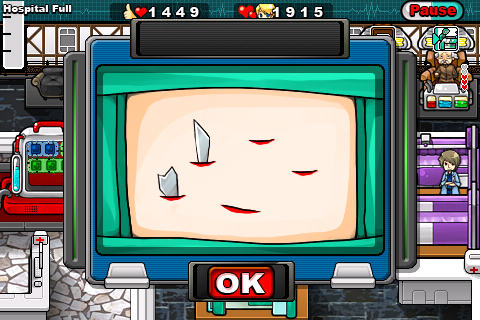 For example some gives patients an instant 1 health point when activated while others allows patient to die slower. The game offers two different modes; the time mode and the story (main) mode, they are very fun, almost as much as the https://www.cozino.com games. The gameplay is very similar but just with different objectives. Overall a very addictive and fun game. You can never stop playing once you picked it up. 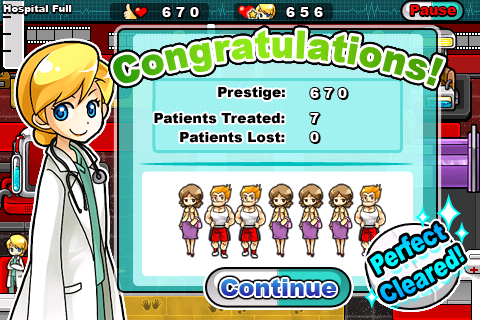 The variety in the types of patients and the mini-games present all make the game balanced and fun throughout the entire 70 levels (story mode). Upgrades keep you wanting to go on to get the best out of each machine and assistant while beautiful cartoon styled graphics make the game simply magnificent. I have to say that the graphics and art are well drawn and splendidly coloured. Everything is so bright, colourful and fabulous. Music in game is catchy but should you want to play your own music the game allows that as well. Are you Alright? is a fantastic game and a must for all time management game fans. It is now out for a special promo price of $0.99 (original $2.99). Now it is time to bid you farewell for it is time to go save my patients! iTunes Appstore Link: Are you Alright?